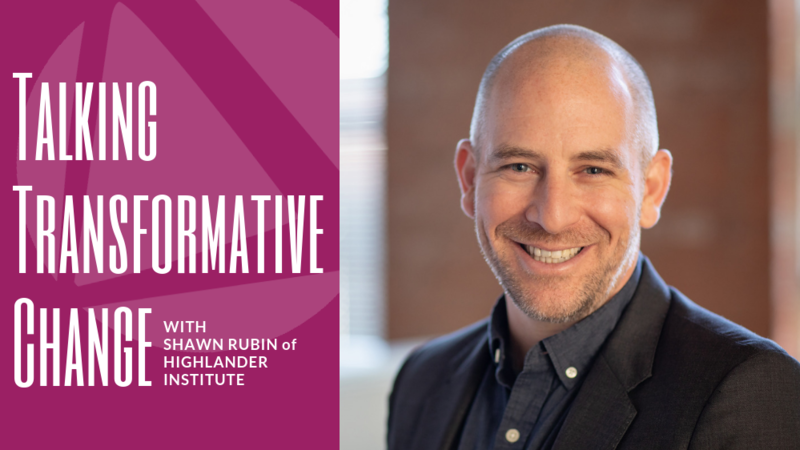 We caught up with the Highlander Institute’s Chief Education Officer, Shawn Rubin, to talk about the recent release of his new book Pathways to Personalization: A Framework for School Change, co-authored with his colleague Cathy Sanford. Highlander Institute—a New Profit grantee-partner and member of our personalized learning cohort—researches, develops, and disseminates innovative methods to improve outcomes for all learners. The book’s practical five-step framework helps school leaders and educators design and implement personalized learning practices based on local needs and contexts. The book summarizes significant learnings from Institute partnerships with a hundred schools implementing blended and personalized learning in southeastern New England, and makes this information accessible to educators nationwide. Q: As a leader of a nonprofit in the personalized learning space, what motivated you to write Pathways to Personalization and what are you hoping to achieve with the book's publication? Shawn: It's an interesting question. I was actually pretty reluctant to even think about this book in the early stages. We were approached by Nancy Walser of Harvard Education Press who found our 2015 white paper, School District 2.0: Redesigning Districts to Support Blended Learning. She felt like the piece clearly described what administrators need to do to support blended learning and what was missing in the field was a more detailed process to help leaders define, develop, and sustain new learning models—not for cutting edge school leaders with rich change management skills and strategies, but for the average school leader just beginning to think about how to lead a change process. Nancy spent almost a year trying to convince us, and I give credit to Dana Borrelli-Murray (the Executive Director of Highlander Institute) who ultimately gave us the push by saying: "We'll make the time. We'll make the space. We'll support you. Go for it." That's really what led to me and Cathy writing the book. What we are really hoping to accomplish with the book is to help school leaders address three fairly universal challenges that we have seen across districts. First, leaders have trouble articulating the change they are seeking and communicating their vision to stakeholders involved in the change process. Second, they are unsure of where to start the change process—how to lead a self-study through a user-centered lens to determine current strengths and challenges from the perspectives of students, parents, and teachers. The final, and hardest piece, is figuring out what step-by-step process can lead them from point A to point B, allowing them to achieve their vision at scale across a school or district. We found that the linear orientation of our framework, combined with a focus on customizing and personalizing based on local efforts, addressed a current gap in the field. Q: Why did this feel like an important thing for Highlander Institute to invest in as an organization? Shawn: Initially, we were not sure that it was an important thing to invest in or that it was the right approach for changing education. We were still deep in the process of exploring, learning, and testing various steps in the framework and were constantly iterating based on breakthroughs and mistakes. As we studied some of our own coaches and staff that were supporting the change process in schools, we realized that we had a lot that we could offer in terms of best practices for schools attempting to implement at scale. We didn't know exactly what it was going to look like when we started writing, but we believed in our hearts that documenting the process would enable us to come out the other side with a strong framework and strategic perspective that would guide our future reform efforts. As an organization that personalizes our approach for every school we engage with, we recognized that this would provide an avenue for us to develop a more standardized change process that schools could replicate. Q: You start the book by noting that this is about moving towards an approach that encourages differentiation, student agency, and a focus on rigor & mastery. Can you bring that to life for us? What does it look like when a school is doing that well, and what does it look like at scale? Shawn: To be honest, I don't necessarily know of a school that does all three of those things completely well in every classroom all day long. As a field, we're still trying to figure out if these are the right north stars. We think they are, but how do we actually get there? We've seen glimmers of hope in individual classrooms. We've seen schools starting to do some of these things at scale. But it’s not necessarily something that you’re going to immediately set out to do and do successfully without a lot of real struggle and multiple pivots in direction. Differentiation: This domain focuses on how teachers leverage continuous student data to inform instructional decisions for different individuals and targeted small groups. Practices within this domain center on how teachers are developing and implementing systems for efficiently collecting and analyzing data with students, scaffolding activities and instruction based on that information, and creating opportunities for students to move at their own pace. Identity, Interest, Agency: This domain encourages teachers to really get to know their students better as individual people and build learning activities that incorporate choice, connect to their identities, or enable them to pursue an area of interest. Practices include how teachers set up their physical classroom space, student reflection and goal setting, and systems for building student engagement and ownership of their learning. Rigor and Mastery: This final domain is really critical. When we talk about things like choice and engagement and culturally relevant instruction, we cannot implement them at the expense of rigor. High standards and a clear vision of mastery can help teachers design challenging and authentic problem-based tasks where students are asked to support their thinking, create new knowledge and apply their learning. Q: Throughout the book you contrast the approach you outline to the typical approach of education reform, noting that often change initiatives take a top down approach. Highlander believes that the most effective approaches are driven by educators and come from practical application in the classroom. How did you come to that realization and what does it mean in practice? Shawn: I think that there's a couple things that led to that realization for us amidst a lot of trial and error. We spent a lot of time just sitting at the feet of some real gurus and learning from the ways that they have failed using the top-down model. One of the reasons we had a lot of work to do right off the bat––which we talk about in chapter 12––was a result of so many districts and schools “going one-to-one” with devices across the state of Rhode Island (e.g. one computer device per student). Districts launched one-to-one initiatives under the guise of equity, meaning every child needed to have the same thing with regard to technology. As you start to unpack what equity really means that's a very narrow definition of it, but school and district leaders felt that it was important to bring their schools into the 21st century. However, when we actually visited one-to-one classrooms, we would see very few changes in terms of practice, which is the real equity issue. This is an example of wasted resources and missed opportunity by applying a top-down mandate. When we took a user-centered lens and started talking to students and teachers about what they wanted, it was not necessarily one-to-one devices. Students wanted more opportunities to have one-on-one conversations with their teacher. They wanted more opportunities to be able to create things in their classroom. They wanted more opportunities to get outside the classroom and to see things in the real world and connect them back to learning in the classroom. So when you look at the need that they articulated, the solutions were not matching those needs. That was a big "Ah-ha" moment for us to reframe all of this around the student and teacher experience. We also realized the power of educator-defined reforms as we developed the concept of a design team. Rather than having a single administrator develop reform concepts in relative isolation, which we have seen a lot, we asked leaders to create design teams comprised of principals, teachers, students, parents and community representatives to help clarify current conditions and identify needs. Through a lot of pre-work around current conditions––from focus groups, surveys, and one-on-one interviews with stakeholders––design teams have been able to deeply understand both what is working and where things currently stand in their local context. Design teams help leaders narrow the focus to relevant, compelling, and timely problems of practice which allow implementing teachers to really buy-in to the vision. What is really important about our model is that it is not exclusively a bottom-up approach. We have learned that great teachers can define high value reforms, but the work cannot be scaled or sustained without concurrent administrative efforts to reduce obstacles and redesign systems and policies to support reform efforts. Q: You note that the framework provided in the book is less of a trail map through a state park and more of a process for bushwhacking through uncharted territory. Why is it that? Why didn't you or couldn't you provide a trail map? Shawn: A lot of that has to do with how much we learned to value local context during the process of writing this book. We learned this the hard way by attempting to bring in particular models like station rotation to all schools or finding particular apps, resources, tools and saying that they will be valuable for everybody. What we found when we did that was that we were short-changing a lot of initiatives that predated us and that if we did not honor the local context in every school, that the work was never going to be fully adopted. Our framework is now flexible enough to support a change initiative of any size or focus, but it requires a commitment to the process which takes three or five years before a school could see change at scale. It is important to explore and unpack specific models of personalization that have been successful, but not integrate them as stock solutions. For example, when one of our design teams shadowed students at a local elementary school, they found that some teachers were not honoring some of the language barriers that the ELL students in the classroom were experiencing. That is a very specific kind of problem of practice that hinders effective personalized learning. So, if you try to take a rigid approach to implementing components of a particular model of personalized learning, then you will not necessarily solve for the problems that are specific to individual schools and classrooms. We had to bake that customized approach into our book ultimately striking a balance between commonly known research-based best practices and local context. Another piece of this comes down to the concept of continuous improvement within our model. We can give you a roadmap that shows you how to launch a pilot but in every instance, we are measuring and observing at a classroom level how the pilot is going. We want to be able see at the local level how well students are able to learn and show growth, mastery, and engagement. A part of this is being able to look at data and identify any unintended consequences of a new school design to understand what is working and not working, which allows each team to iterate on the design and improve it over time. Q: What excites you most about the field of personalized learning? Shawn: The piece that excites me most is how rooted personalized learning is in the best of historic education and theory. If you go back to the work of John Dewey, Paulo Freire, and Maria Montessori you see the tenets of what we're attempting to scale. We didn’t just develop personalized learning strategies out of the blue and start to test them in classrooms. These personalized learning tenets embody education at its core: getting to know students as individual humans, but also helping them understand their worth and their value within their community; helping them understand their culture and their identity; enabling them get instruction at their right zone of proximal development; and helping them apply their learning in ways that honor their interests and strengths.